Most of you, reading this blog must have seen or bought flower bouquets. I don't know whether you've ever noticed or asked the florists about the flowers he's putting in your flower bouquet. There are a large varieties of flowers and plants which are used as cut flowers and fillers for bouquets and other floral decorations, and during the monsoon period (during early July to late August), you'll find one particular variety, i.e. 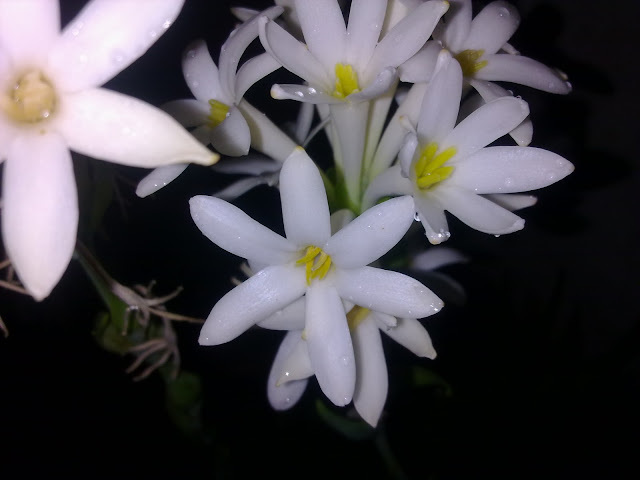 the Mexican Tuberose Polianthes tuberosa (also known in India as Rajnigandha). Those long stemmed white buds of flowers, that feature in most of the bouquets and floral decorations, are actually rajnigandha. The rajnigandha, owing to its hardy nature and long slender flowering stem, have achieved this reputation of being an extremely liked flower by florists. The Rajnigandha (Mexican Tuberose) belongs to an annual variety of bulbous plants, that have extremely fragrant white coloured flowers, which bloom during night. 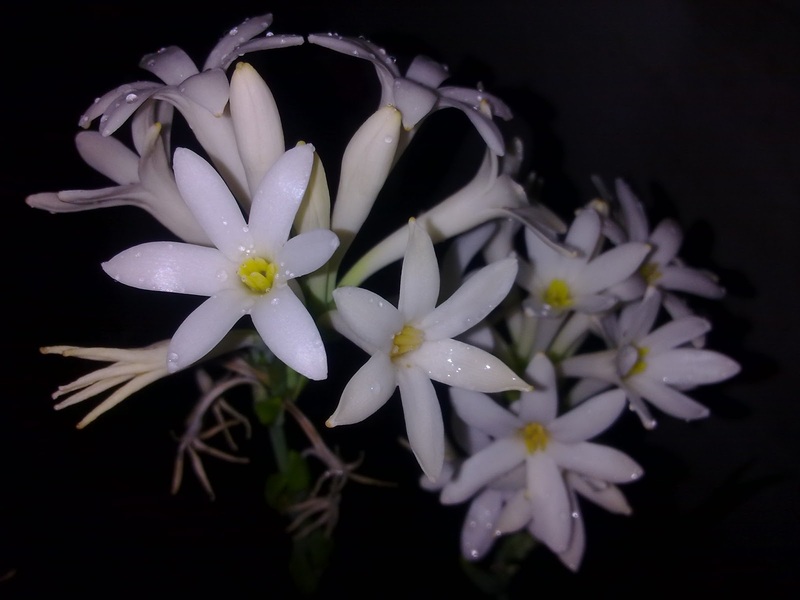 These plants bloom only during monsoon (July-August in India), when there is ample rain. Since, I think of myself as an amateur photographer, that too without any dedicated camera (I use my 5mp Nokia smartphone for clicking my pics) and like practicing my hobby on my plants, I have clicked hundreds of photographs of my plants. That applies to the tuberoses too. 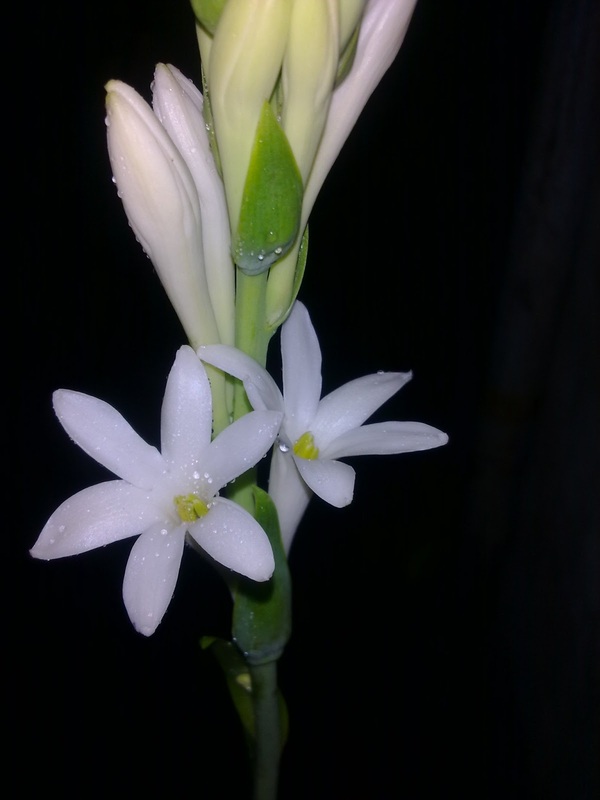 Photograph of the Mexican Tuberose, an integral part of my small rooftop garden. 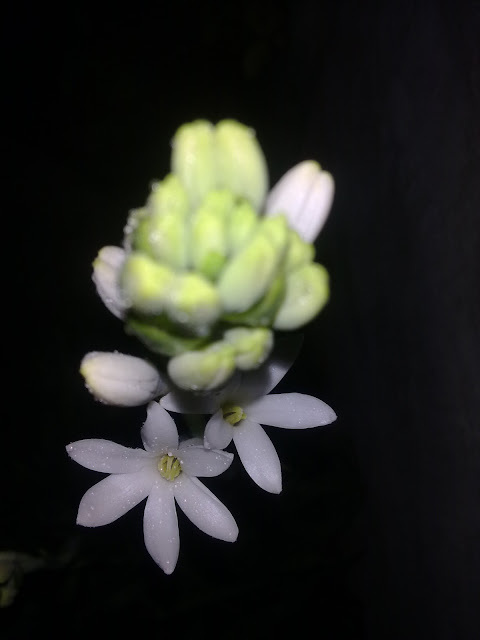 Photograph of the Mexican Tuberose, an integral part of my small rooftop garden. Take a look at the other stems in the background. All were ready to bloom, during the monsoon period. 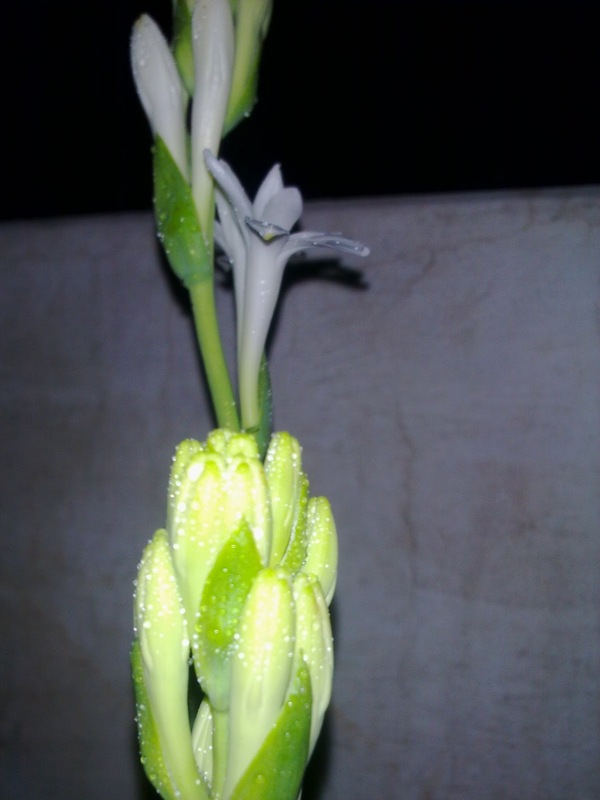 Photograph of the Mexican Tuberose, an integral part of my small rooftop garden. Imagine so many clusters of flowers blooming in your garden. The ones with water drops were most probably captured after rain, or some drizzle, as it was during the monsoon season. 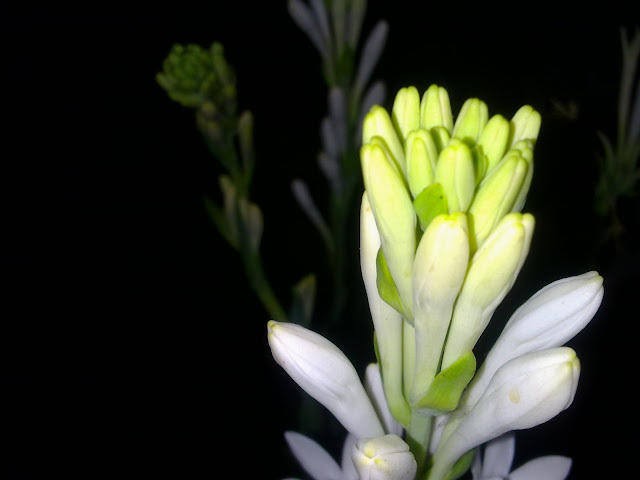 Moreover, all the images were clicked during night, the time when the new flower buds open up, to spread their mesmerizing fragrance in the surroundings. The best part about the tuberose is it's fragrance, which is simply mesmerizing. The second thing that is good about is the ease at which you can plant have it in your garden. 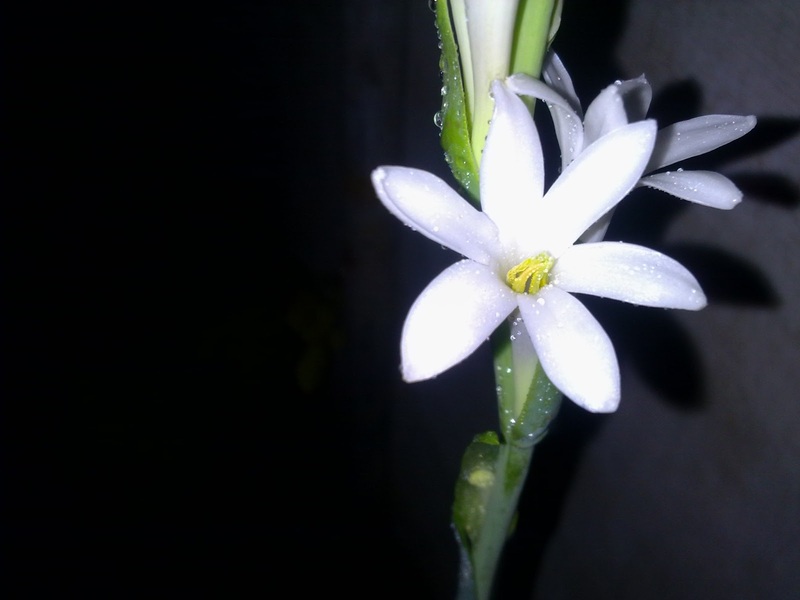 Just bring in a bulb of the tuberose, plant it in soil, just water it every now and then, and forget about it. I have experienced this and can say that, from just one bulb, you can get a full farm of tuberoses in just two years. Thanks Anjan. It's one my favourites too. Gracias por su comentario y siguiendo mi blog. No sé español, así que, estoy usando el traductor de Google, por lo que, no puedo decir si se trata de traducir correctamente. Thank you for the information too. Will surely get a bulb and plant in my balcony! Do these flower only in the monsoons? Thanks, a lot for the encouragement, Magiceye. Yes, as far as I have seen and experienced, the rajnigandha blooms in monsoons only. Actually, that's the time, when you can see bunches of those pretty flowers being sold at florists and also at some of the traffic signals in big cities here in India. Although, I've had one plant flowering about a fortnight back, which probably, was due to the fact that I transplanted some bulbs late into the flowering season. And yes, I must say that planting the rajnigandha is worth a try. You'll have some nice flowers and an ecstatic fragrance.